The olive bar at Wegmans is one of Tinsley’s guilt pleasures. She loves to indulge on their amazing selection of gourmet olives. They are the perfect salty treat, after a long day. 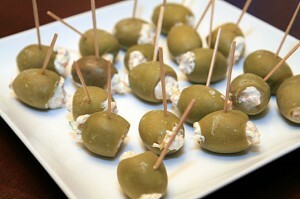 Recently, she has been seeing different gourmet vendors market new stuffed olives. Unfortunately, they have a hefty price tag to go along with their unique flavors. Tinsley knew they looked easy to make and she came up with her own recipe to share with you. Impress your guest at your next cocktail party with these adorable olives without paying the gourmet price. With a paring knife, remove the pimentos from the olives. Finely chopped the pimentos and add them to a small bowl with goat cheese, lemon zest and juice. Mix together with brine until creamy. Transfer cheese mixture into a ziplock bag for piping. Using your paring knife, create a larger hole on the pitted size of the olive as well as a small hole on the opposite side. Snip the tip on the zipock bag and pipe the cheese mixture into each end of the olive. Can you use feta cheese? Yes, you can! Thanks for the comment.